Press this button to listen to the radio or change radio frequency bands. 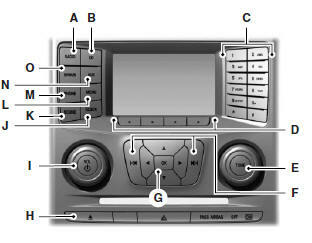 Press the function buttons below the radio screen to select different radio functions. : Press this button to listen to a CD. 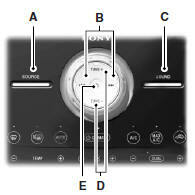 Press the function buttons below the radio screen to select on-screen options of Repeat or Shuffle. • In radio mode, store your favorite radio stations. To store a radio station, tune to the station, then press and hold a preset button until sound returns. • In CD mode, press one of these buttons to select a track. 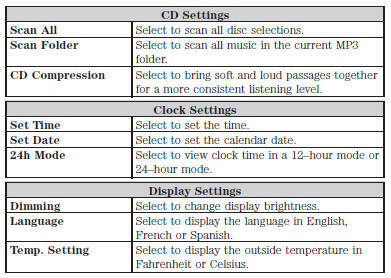 D. Function buttons: Select different functions of the audio system depending on which mode you are in (such as Radio mode or CD mode). 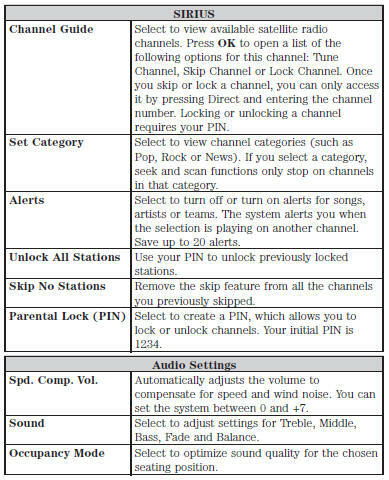 E. TUNE: • In radio mode, turn the control to manually search the frequency band. • In satellite radio mode, turn the control to tune to the next or previous channel. 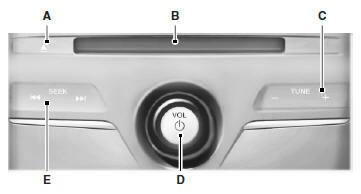 • In radio mode, select a frequency band and press one of these buttons. The system stops at the first station it finds in that direction. Press and hold one of these buttons to move quickly in that direction to the next strong radio station or memory preset. • In Sirius mode, press one of these buttons to select the previous or next channel. If you select a specific category (such as Jazz, Rock or News), use these buttons to find the previous or next channel in the selected category. Press and hold one of these buttons to move quickly in that direction to the next channel or category. • In CD mode, press one of these buttons to select the previous or next track. Press and hold one of these buttons to move quickly in that direction within the current track. • Press the up and down or left and right arrow buttons to browse menu selections. • Press OK to confirm menu selections. H. Eject: Press this button to eject a CD. : • Press this button to switch the system off and on. • Turn it to adjust the volume. Press this button to access the clock setting. Use the center arrow controls to change the hours and minutes. Press this button to adjust settings for Treble, Middle, Bass, Balance and Fade. L. MENU: Press this button to access different audio system features. See Menu structure later in this section. M. PHONE: Press this button to access the phone features of the SYNC system. See the SYNC chapter for more information. N. AUX: Press this button to access your auxiliary input jack or switch between devices you plug into the input jack or USB port. See Auxiliary input jack later in this chapter. O. SIRIUS: Press this button to listen to Sirius satellite radio. Depending on your system, some options may appear slightly different. Press the up and down arrow buttons to scroll through the options. Press the right arrow to enter a menu. Press the left arrow to exit a menu. The MyFord Touch system controls most of the audio features. See the MyFord Touch chapter for more information. Press this button to eject a CD. - : • In radio mode, press these buttons to manually search through the radio frequency band. • In Sirius mode, press these buttons to find the next or previous available satellite radio station. 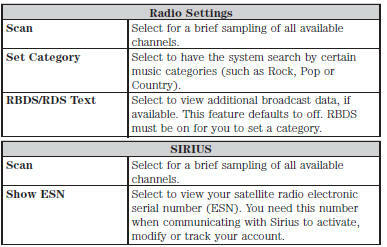 • In Sirius mode, press these buttons to select the previous or next channel. If a specific category is selected (such as Jazz, Rock or News), use these buttons to find the previous or next channel in the selected category. • In CD mode, press these buttons to select the previous or next track. The MyFord Touch® system controls most of the audio features. See the MyFord Touch® chapter for more information. Press this button to access different audio modes, such as AM, FM and A/V Input. C. SOUND: Press this button to access settings for Treble, Middle, Bass, Balance and Fade. : • In radio mode, press these buttons to manually search through the radio frequency band. • Press this button to switch the system off and on. HD Radio broadcasts are not available in all markets. HD Radio technology is the digital evolution of analog AM/FM radio. 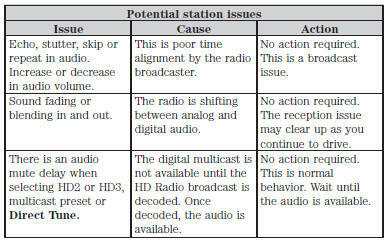 Your system has a special receiver that allows it to receive digital broadcasts (where available) in addition to the analog broadcasts, it already receives. Digital broadcasts provide a better sound quality than analog broadcasts with free, crystal-clear audio and no static or distortion. For more information, and a guide to available stations and programming, please visit www.hdradio.com. When HD Radio is on and you tune to a station broadcasting HD Radio technology, you may notice the HD Radio logo on your screen. When this logo is available, you may also see Title and Artist fields on-screen. 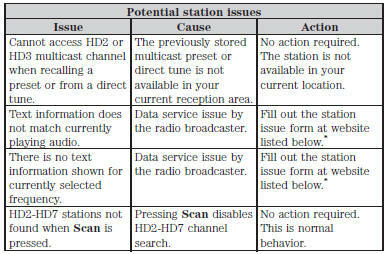 The multicast indicator appears in FM mode (only) if the current station is broadcasting multiple digital broadcasts. The highlighted numbers signify available digital channels where new or different content is available. HD1 signifies the main programming status and is available in analog and digital broadcasts. 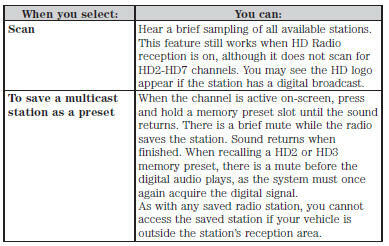 Other multicast stations (HD2 through HD7) are only available digitally. In order to provide the best possible experience, use the contact form to report any station issues found while listening to a station broadcasting with HD Radio technology. Independent entities own and operate each station. These stations are responsible for making sure all audio streams and data fields are accurate. HD Radio™ Technology manufactured under license from iBiquity Digital Corp. U.S. and foreign patents. HD Radio™ and the HD and HD Radio logos are proprietary trademarks of iBiquity Digital Corp. Ford Motor Company and iBiquity Digital Corp. are not responsible for the content sent using HD Radio technology. Content may be changed, added or deleted at any time at the station owner’s discretion.